If you’re a kitchen lover like me, there’s no skimping when it comes to kitchen design. Even if we happen to be working within the confines of a relatively small or modest kitchen area, the kitchen is too important to not be designed thoughtfully, with both aesthetics and functionality in mind. The kitchen is, after all, one of the most crucial spaces in any domestic mix: it’s the engine of our homes, where we spend so many hours preparing our meals, conversing with our nearest and dearest and, depending on where your meal areas are situated, where we nourish ourselves over delicious food and drink. As you'll probably agree, life’s just too short not to have a fabulous kitchen! Like all rooms and facets of interior design, we’ve come a long way since to the more humble, basic and perfunctory kitchens of the past. Modern technology continues to revolutionise our mod-cons and appliances, while our furniture and design options continue to expand at an incredible rate. Never has there been more choice and range of styles and trimmings to incorporate into our spaces – kitchen included! Today on homify, we’re championing one of our favourite rooms in the whole domestic mix, with a look at some of the most ‘must-have’ kitchen interior design items, attributes and stylistic trimmings, from furniture to worktops, fancy utensils to stainless steel cookers, cutting edge appliances and beyond. Take a flick through, imagine what’s possible in your kitchen, and get inspired about making the absolute most of your kitchen too. When we think of the kitchen, there are few items that come to mind instantly, and the most crucial is perhaps the all-important refrigerator. Generally speaking, we can’t get by without a fridge, and, given that it’ll be part of our lives for a good decade at least, it makes sense to have the best, and most pleasant to look at variety possible. These days (just like the home itself) a single frontage will get you only so far. Today, it’s all about the double feature, and the same goes for the fridge as much anything else. Though probably more suited to the larger family household than the single occupant, a double fridge can be a fabulous must-have addition to any modern kitchen today – just think of the storage space! 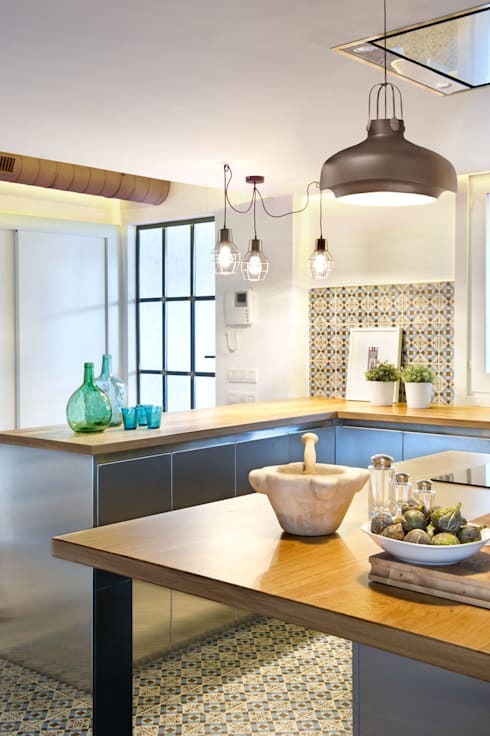 Given how much time we all spend in them these days, and how much more conducive they are to multiple purposes, today’s kitchen is nothing without a bright and fantastic array of interior lighting. 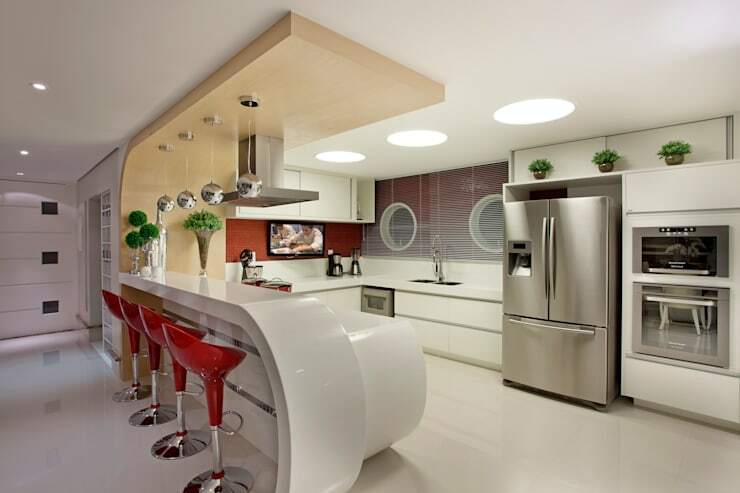 Keep the kitchen bold and beautiful with a few feature fixtures, and enhance the functionality and mood of your space. Here’s a great example of what’s possible: a central downlight for all your food preparation needs, working well with a trio of industrial-style globes by the seating area. Bright, exciting, vibrant and warm: all the things a good kitchen ought to be. Another ‘must have’ for today’s modern kitchen has to do more with a broader style rather than a single or set of items or furniture. 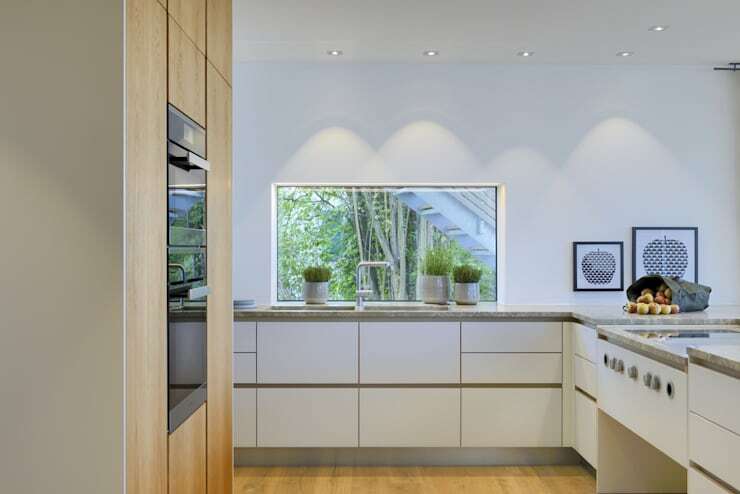 Minimalist style is derived from the philosophies and principles of Eastern cultures, most notably the Japanese, and these days, it remains a popular and ever evolving style in the modern design world – especially when it comes to the kitchen interior. Clean lines, few accessories, open space and breeziness are some of the attributes associated with the style, with clear influences present in this fabulous example: bright, white paint for the walls and cabinetry, open view to the surrounding garden areas, simple appliances and a sense of unmistakable harmony – a must have for any kitchen! Given all the attention given to the ‘foodie’ scene in recent years, with an endless array of food- and chef-related television series besieging our screens, items that were once the domain of the commercial kitchen have begun to pop up with greater regularity in the domestic kitchen as well. A reflection of the accessibility and knowhow surrounding good quality food and food preparation, many kitchens these days are going for a more commercial and industrial aesthetic. 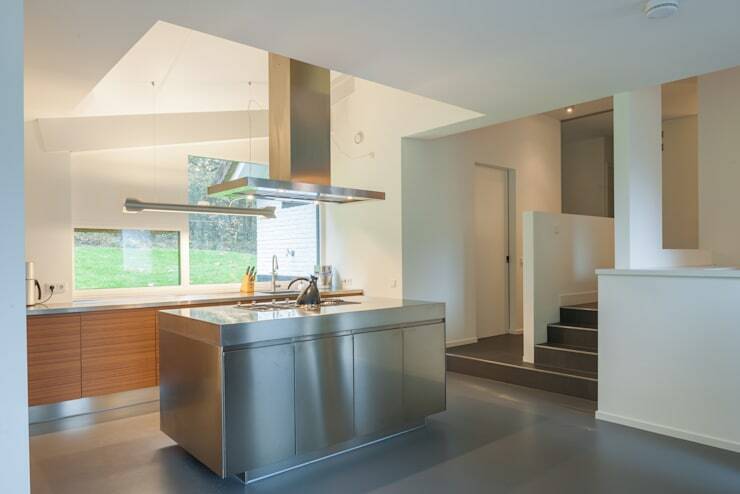 Stainless steel is one of the most popular modern kitchen workbench materials available, giving a great balance of aesthetic and functionality to the modern kitchen space (whether you’re a ‘foodie’ or not). It’s 2016 folks, and whether you like it or not, we’re living in the future. No, we haven’t quite reached the point where we’re getting around in flying cars, on hoverboards, or shooting back and forth through time, however there are a few things to get excited about. 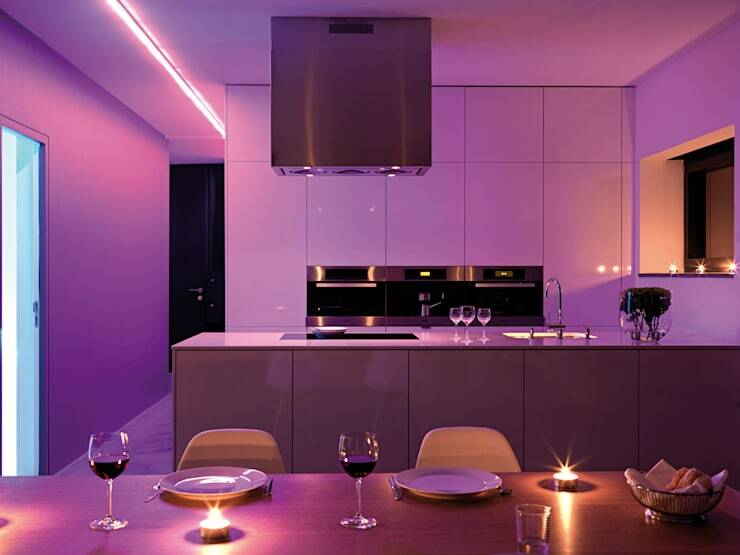 One of them is feature lighting, and in particular, the availability of colourful neon and LED lights for all our home interiors, kitchen included. Take this amazing, sultry kitchen and dining set up: a few strips of deep pink neon splendour to add a little space-age flavour to your meals and company. Very cool! It’s all well and good to fit out your kitchen with all the best furniture, appliances and hardware, but it’s all for nothing if you’ve left out the small things. It’s the little things that make the difference, but especially in the kitchen. 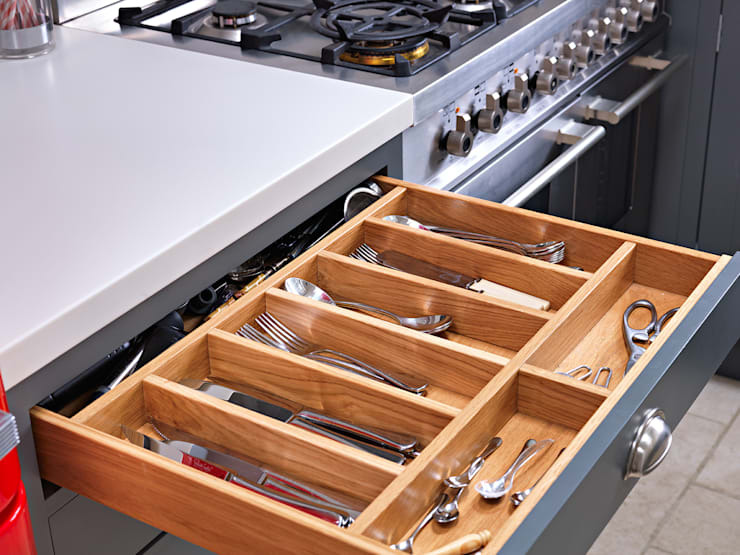 One of the most crucial must-haves, on top of all the mod-cons and stylings, is a few drawers full of excellent, well-crafted and impressive to hold and use utensils. Drowning in a sea of old, rusty, blunted forks, knives and spoons? Don’t settle for it any longer – get rid of the old and usher in the new, with a fresh influx of fabulous kitchen utensils. But of course, for the best possible and most impressive looking kitchen around, why not invest in a few of the latest appliances and utilities? Technology has never been more advanced when it comes to kitchen accessories, so we really ought to take advantage and implement the best for our homes. 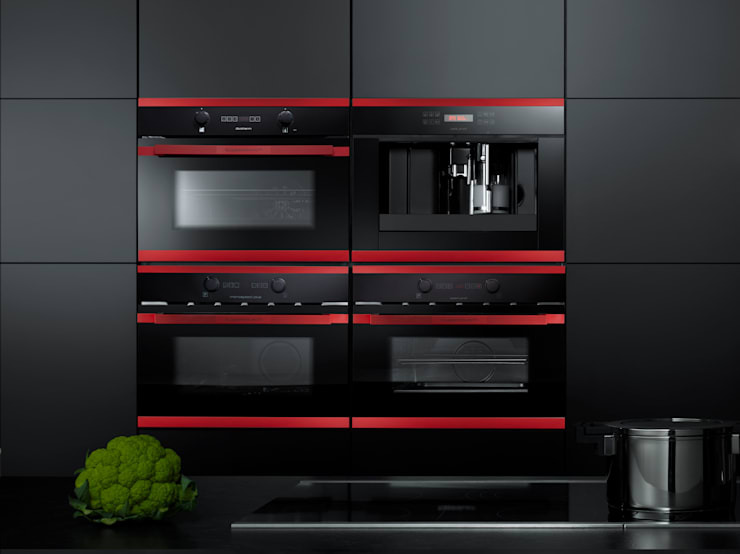 Here, we see a sleek and fantastic example of what’s out there today: immaculately designed, incredibly functional, highly versatile and aesthetically stunning wall-based cookers and ovens. We’ve come a long way from the clunky old stovetops of decades past; check out the variety of options available, and get excited about giving your kitchen the amazing overhaul that it, and you, deserve. Did you enjoy that Ideabook? Why not add to these freshly baked ideas with a look at Making the most of your compact kitchen? Which kitchen 'must-have' do you love the most? We’d love to hear from you in the comments section below!